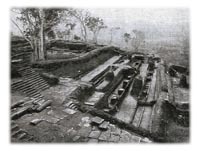 This 1898 article tells the remarkable story of the archaeological excavations at Sigiriya in Ceylon. Sigiriya was a large rocky outcrop that could be seen for miles around. It had long been thought to be out of bounds and haunted by demons by the local population. Parker's article first appeared in Volume 1 of the Harmsworth magazine published in 1899. Perhaps the most remarkable rock in the world is to be found in the centre of the Island of Ceylon, and its story is full of romance. It was fortified 1,400 years ago to shelter a cowardly parricide, and when he died it became a Buddhist monastery. But for centuries no human foot rested on its summit; it was the abode of silence; its walls were buried beneath the dust of ages, birds built their nests on it and the beasts of the field haunted the jungle which grew about its base. Now, British officials have scaled its walls, excavated its ruins, and revealed the ancient splendour of the place, and so doing have discovered that this rock fortress is one of the most wonderful pieces of engineering of ancient times. 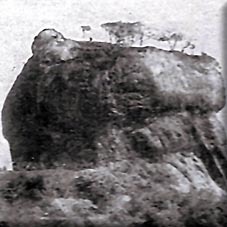 It is called the 'Sigiri' or 'Lion Rock', and lies fourteen miles north-east of Dambulla. It is cylindrical in shape, and rises up nearly 600 feet sheer from the ground, while the area of the summit is little over an acre. Its scarped walls are nearly perpindicular, and in some places they overhang their base. Recent excavation shows that all round the foot of the rock there was a fortified city, surrounded by a moat. But the most wonderful feature of this fortress was the terrace, ornamented with lions, which ran round the north face of the rock at its smallest diameter. At one part it stood upon the rock which projected below, and at the same time was protected by that part which overhung it. The terrace then zig-zagged up the rock at an easy gradient, and so gave access to its otherwise inaccessible summit, to which, in the last resort, the fugitive intended to flee. One hundred yards of this terrace still remains, and its structure of several courses of brick can clearly be seen in one of the photographs, while the grooves in the rock show where the rest of it ran. Professor Davids says that the path was on the top of a solid brick wall, four or five feet broad, which was carried along the face of the cliff. "The cliff being perpendicular, this wall had to descend far below the path before it found a resting place on the edge of the rock. As the path was gradually carried forward and upward, a line was dropped from it to the rock beneath, and where the line first touched the cliff - however far below- a flat place was scooped out, large enough to support a single brick. This was done along the whole breadth of the path, and then the solid wall was built up to the requisite height, while some of the other rows of bricks were carried high enough to form a wall breast high on the outer side." Half way up the rock, or 160 feet from the ground, was another extraordinary feature. There can be seen, by means of a telescope in two caves or pockets some vividly painted frescoes. How they were painted in such a position no one knows; but, despite their clearness of outline and freshness of colour, it is certain that they were painted by artists 1,400 years ago. But though we do not know how these frescoes were painted so long ago, thrilling stories can be told of how two artists made copies of them non long since. 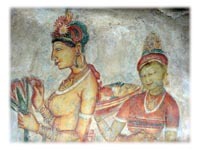 Mr Alick Murray, of the Ceylon Civil Service, was requested by the Governor of the Island to make an attempt to reach these frescoes, and he succeeded in an amazing manner. The first part of the way lay through the forest, which was cleared with billhooks by the natives. At the outset the resident chiefs and local population would have nothing to do with the disturbance of a rock chamber which they believed to be inhabited and protected by demons, so Tamils had to be brought over from India. 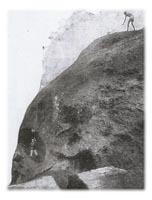 Three Tamil stone cutters bored holes in the rock face, one above the other, and therein placed iron "jumpers", which were secured with cement. To these wooden staging was lashed. "The man of lightest weight", says Mr Murray, "was selected to make the necessary holes', but after a while even he declared that it was impossible for him to ascend any higher. But he said that if he were allowed to devote three days to fasting and prayer to his gods, he thought he might succeed, and so he did. "But when the pocket was at last reached it was found that the floor was at too steep an angle to admit of anyone or even sitting on it. Iron stanchions were therefore let into the floor, and a strong trestle or framework made secure to them. On this framework was placed a platform, and from the platform the work of tracing thirteen of the frescoes in the biggest cave was carried out." Mr Murray's task was surely unique. From sunrise to senset for a week he did his copying lying on his back. "Below me," he says, "was a sheer drop of 160 feet. The wind at times was terrific, and I literally held my breath as some blast swept into and around the chamber, and ruthlessly tore and carried off the work of hours. On one occasion a blust fiercer than the rest shook the platform to its very base, and the lashings slackened by the dryness of the atmosphere, allowed the platform to sink suddenly a few inches, when its downward progress was happily arrested by the bracing underneath. The only inmates of the chamber were swallows, who occasionally pecked at me resentfully." The frescoes are life-size figures of women, arranged singly or in sets of two. Each couple represents a mistress and maid, the maid wearing in each case a jacket exactly similar to that used by Tamil girls today. When Mr. Murray had finished his work it was suggested that it would be a good thing to leaving something in the "pocket", in the shape of a memento. A bottle was therefore obtained, and in it papers of the day and local coins were placed. As he was leaving with his companions a Buddhist priest asked to be allowed to pray for the preservation of the bottle, and while he prayed Mr. Murray and his companions sang "God save the Queen," by way of dedication - a characteristically British proceeding. 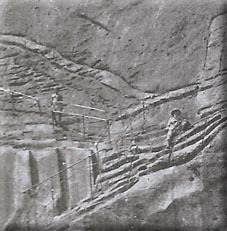 Mr. Murray's tracings caused so much interest in the wonderful Rock Fortress, that the Government of Ceylon instructed its Archaeological Commissioner, H C P Bell, to survey and excavate it - a work of much adventure. Hair-breadth escapes inevitably occurred, and all the time the work was in hand Mr. Bell declares that he was on mental "tenter-hooks". He first reached the top of the rock by means of jungle wood ladders and six inch grooves cut in the rock. But once up, iron ladders and an iron rail were fixed so that constant ascent and descent could be made. During the first fortnight the workers were attacked by swarms of bees, which drove them from the rock. These had to be burned out before the work could proceed. But the greatest trial was the dreadful heat of the sun, from which there was no shelter. The work began at 6.30 in the morning and continued until 3 o'clock, and 8 and a half hours in the scorching sun, day after day, and week after week, was no light task. The whole day was spent aloft, for too much time would have been wasted if "lunch" and been "served" below. Fortunately, a big cistern was discovered at the top, from which beautiful water could be obtained. When the first prejudice had died away, plenty of workers could be found, and sometimes over a hundred of them were at work and swarmed up the rock with as little excitement as English workmen pass through the factory door. The top was found to be covered with forest trees and a dense undergrowth, neck high, so a gang of Singhalese were engaged to burn them down. When the summit was excavated it was found that buildings covered it to the very edge of the cliff, and every basketful of earth had therefore to be spilt over the side of the rock - otherwise it would have to be moved twice over. The depth of earth cutting varied from five to twenty feet, and when the whole area was cleared the plan of the long lost buildings was easily seen, virtually as perfect as when first laid out. The natives declared that there was a passage from the summit into the bowels of the rock, but that is not the case. "The rooms and courtyards" says Mr. Bell, "stretch the whole length of the ridge, in generally ascending tiers, from the small chamber directly above the rock cistern at the south to the penultimate and uppermost room near the north end. All are oblong, and all - or nearly all - the chambers had corridors completely round them." "Many passages were paved throughout with quartz slabs; though much of this choice pavement has been displaced by the waste of centuries, or from being deliberately put to other uses by Buddhist monks when the fortune of war found them located in the 'marble halls' of royalty"
Even around the summit of this inaccessible rock a remarkable was built. It rose from the brink of the precipice, for its foundations were some feet and even yards below the level of the summit. Accompanying Mr. Bell on this expedition was Mr. D. A. L. Perera, whose purpose was to paint in oils facsimiles of all the frescoes in both caves. Both were anxious to photography the two pockets at a distance, and as they could not stand in the air, a four inch hawser was lowered from the summit of the rock to the ground, and a strong iron block bound to the end. Through the block a new two inch rope was passed, and an improvised chair firmly tied to it, and in this case the photographer took his seat. The hawser was then pulled half way up to the west rock till the chair was over 150 feet from the ground and 50 feet clear of the cliff. Swaying in mid-air through the force of the wind, the photographer exposed his negative, but as the shutter worked too slowly the pictures taken wer more or less blurred. Mr. Perera then decided to to an oil painting of the pockets to scale while swinging at the end of the rope, and after rocking in space for a week succeeded in his task. But the exposure day after day to the intense glare of the rock's summit affected his eyesight, and he was compelled to take complete rest for some weeks. One of our photographs shows Mr. Perera at work. Thirteen of the pictures were painted from the floor of the cave; to do the others "it was necessary to construct a cantilever of jungle timber firmly lashed to a stout iron cramp let into the rock floor. To the extremity of this projection was tied to a rough 'cage' of sticks; and from this uncomfortable and perilous perch the loftiest fresco was made." This was painting "in the open" with a vengeance. Enormous difficulty was experienced in painting the frescoes in the small cave (which was only three feet wide) and in getting to that cave from the other. The ledge between them was only a cubit in width. But by paying special remuneration Mr. Bell got some men to risk their lives in making a "stick shelf." One inch iron bars supported the woodwork, which was banded strongly to thick iron cramped into the rock. 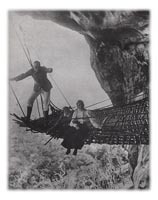 But in addition it was held up by a central hawser, and side ropes hauled taut round trees on the summit of the rock nearly 300 feet up. When finished this improvised platform stood out from the cliff 15 feet horizontally! In these wonderful, dangerous, and eerie open-air studios, Mr. Perera spent nineteen weary weeks painting on canvas a complete set of the 22 frescoes which were first painted 1,400 years ago. These are marvellous in their faithfulness and colour. Before Mr. Perera began to paint the frescoes, iron standards 3 feet 4 inches in height, with a single top rail, were driven along the edge of both pockets and the connecting ledge between them; for without such handrail a slip on the smooth inclined floor of the pocket would have meant instant death on the rocks below. Yet another adventure was the outcome of this exciting survey, and Mr. Bell vividly tells the tale. "High up on the eastern face of the rock," he says, "May be noticed a dark streak betokening caves, and these we resolved to survey. But the rock scarp below them being nowhere less than 30 degrees in slope, and in places sheer, ascent without the aid of a rope was impossible. The four inch hawser was therefore let down to the ground as before over the brow of the caves. "Up this stout rope half a dozen of the strongest and most sure-headed coolies swarmed to the apparent mouth fo the caves. The measured distance was 294 feet, climbed hand over hand the whole way up. 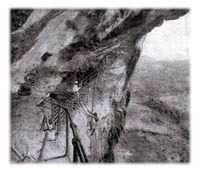 But arriving at this height they found that they were 50 feet distant from the caves and still below their floor, with no means of getting nearer, owing to the projecting crag above, and the rope's own weight keeping it taut." "Ultimately a brave Singhalese lad with a light rope round his waist swung himself on to the rock as high as he could, and crawled crocodile fashion the rest of the way up the steep smooth slope while the men held the other end of the rope. Once in the caves he noosed the rope to a piece of fallen rock, and next day a strong iron ring was driven into the floor, and a hawser passed through it." "Then Mr. Perera and I made the ascent. The largest cavern was 197 feet long, with a floor width averaging 11 feet. No vegetation grows therein. But we did find under a rock in the dave three eggs of the peregrine falcon, which vary strangely in hue from chocolate to almost white. The eggs of this bird have never been taken in Ceylon before." "We were grievously disappointed with our search, and had to be content with a bare negative gain - the absolute assurance that the caves contained no trace of previous human occupation. The foot of man never desecrated this sanctuary of the eagle and falcon before. Being virtually inaccessible, it was left to bird and bat and mountain bee. Overhead the beetling crag jutted out forty feet and more, while underfoot the rock floor was polished and slippery from untold centuries of wear by the feet of myriads on myriads of birds." If, however, in years to come an adventurous climber climbs to this chamber of the winds he will find in a niche a sealed record of its daring exploration, and in just such a way the buried buildings on the Sigiri Rock are the record of a crime of 1,400 years ago. A king of Ceylon was buried alive with his face to the west by his brutal son, who became king in his place. This in its turn was said to be a punishment because the old king had buried alive a holy man who was in his way when building a great tank. But, dreading the revenge of his brother, the young king fortified the Sigiri rock. There he lived for eighteen miserable years, and at the end of that time his brother came and slew him. He happened to turn his elephant to avoid a pit, and, thinking he was running away, his people lost heart and the enemy cried out, "They're running away." Instead of hiding within his fortress when the critical moment came, the man it was to protect had lost faith in it, and in his misery went out to his last fight.